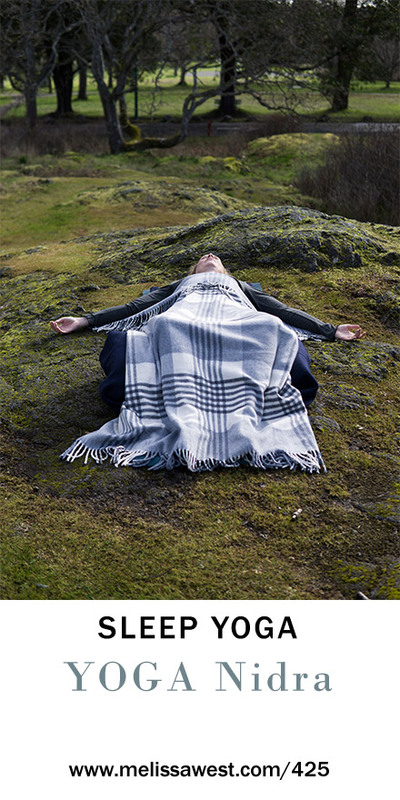 Yoga nidra is a guided meditation that takes you to a place of relaxed, spacious awareness. You will be guided into a state of effortless non-doing. 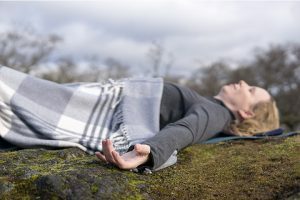 Through your experience of yoga nidra you will enter into a conscious sleep where your mind slows down and your thoughts move further and further away from you. Yoga nidra quiets the inner noise of your mind and allows you to experience less stress and anxiety. The guided verbal instructions will lead you to a state of consciousness that are somewhere between waking, dreaming and sleeping. In order to practice yoga nidra you want to be as comfortable as possible. You can practice it on a yoga mat, but you could also practice it in bed, on the couch or in a chair. You are going to be here for 20 minutes, so it is a good idea to have some padding underneath you and a blanket overtop of you in case you get cool. You might want to have a pillow under your head so that your chin is slightly lower than your forehead. This will allow you to access your parasympathetic nervous system – your rest and digest. Using and eye pillow or covering your eyes will allow you to access your inner senses. When you practice yoga nidra there is no way you can do it wrong. Let go of trying to do it right. You don’t need to try to stay awake or to try to have a deep experience. You may even fall asleep and that is not a problem. Should you feel discomfort or resistance to your practice, know that it is not unusual. If physical discomfort or pain persists feel free to adjust your position to become more comfortable. Distractions are often a good way to come back to our practice. Remember, you are always free to step away from your yoga nidra practice at anytime if it becomes overwhelming. If at anytime, the words of the guided meditation do not work for you, let them go, and be with the guidance of your own inner teacher, it always knows best. As I mentioned, there will be no closeout today so that you can go right to sleep or relax into your relaxation. I want you to get the most out of your experience. I will put the direct link to the downloadable audio file for our members in the show notes and a link to become a member if you would like access to the downloadable file which is just the yoga nidra without all the youtube promotion and preamble at the beginning, the member only audio starts right from the yoga nidra.